The Revenue Panel provides instant visibility over the revenue that has been generated through accepted proposals for the current financial period. The panel displays actuals (already invoiced amounts) as well as accurate forecasted amounts for future months. The revenue graph plots the actuals and forecasted amounts for each of the months in the current financial period. Each month is broken down into Recurring (recurring, pro-rata, and scheduled invoices) and Billed Project Work (On Acceptance, On Completion, Deposits, and Estimates). Recurring is shown in dark blue, while Project Work is shown in light blue. Actuals are displayed as solids, while forecasted amounts are displayed semi transparent. 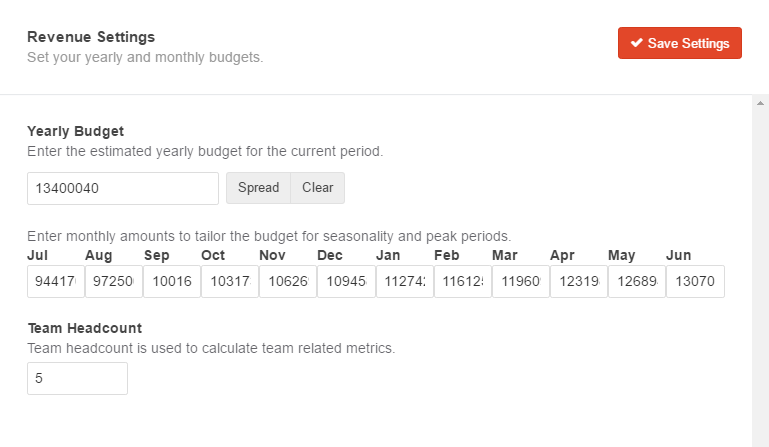 Hovering over a month will display a more detailed tooltip with breakdown amounts and a variance against the budget (if set). The only unbilled project work forecasted are On Completion services which are forecasted on the engagement's last month. We do have plans to support estimated billing date which will allow these amounts to be graphed for future periods. Note: If the Invoice Schedule is enabled, these amount are treated exclusively as recurring and a future update to the Invoice Scheduler is planned to remove the ambiguous upfront/recurring inputs. Projected Total - The sum of all the revenue (actuals and forecasted) derived from the proposals that were accepted during the current financial year. The variance compares the difference between this financial year against last year's. Invoiced - The total revenue invoiced to date derived from proposals accepted during the current financial period. The variance compares the difference between this calendar month against last calendar month. Unbilled Projects - The total amount of On Completion and Estimate services that are yet to be invoiced. The panel uses the estimate's minimum value. Please note, this value includes project revenue from both active and completed proposals. Monthly Average - The sum of all revenue (actuals and forecasted) in the current financial year divided by 12. The variance compares the difference between this calendar month against last calendar month. New Client Revenue - The projected total of proposal that belongs to clients that did not have an engagement before this financial year. Tip: Check out this article to learn about different ways to bill your clients. Seen in the above screenshot as a plotted line chart, a budget can be defined for the current period and once saved this will be displayed over the revenue bars. To set a budget, hover over the panel on the right side of the word 'Revenue' and click Settings. A slider will show up on the right part of the page. To get started quickly, a top level yearly budget can be entered and then this can be spread evenly over the months where further adjustments can be made. Note: Team Headcount is meant for our planned Sales and Engagement focused funnel. You can go ahead and enter your team headcount so that your metrics will be automatically calculated once these planned panels are released.